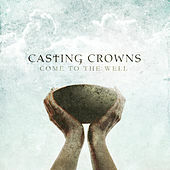 The Christian faith is full of references to water, so it's only natural Casting Crowns would borrow that theme for their fifth studio album, encouraging us to let the living water of Christ well up until it spills over onto everyone around us. That's a lot to tackle on one disc, but they've always been ambitious when it comes to message, and they're only getting bolder. Their passion is front-and-center on tracks like "Jesus, Friend of Sinners" and "Already There," while "My Own Worst Enemy" finds them rocking out. Don't miss "So Far to Find You," co-written with Steven Curtis Chapman.